This will be the 3rd straight year i have qualified a team for the Hawaii Ironman. We have 5athletes qualified so far in 2013, adding to the 9athletes we had race Hawaii in 2011/12. As a result, putting down initial program ideas on how to prepare them for October. One thing is for sure, preparing athletes for everything Hawaii brings: the wind, the heat, the humidity, and the course is a whole different ball game to prepping them for a local Ironman like Melbourne. The Hawaii bike and run course isn't really the main problem, its the weather that's makes Hawaii special. The preparation has to be about making the athlete as strong and impervious to the conditions as possible. Non wetsuit swim, this swim can be a new and often daunting experience, even for the most experienced ironman. The current at Hawaii also can wreak havoc with swim times. The bike with the cuttings and cross wind tunnel like conditions in the gully's in between. The climb to Hawi, and cross winds on the descent. Then on the return the wind hits you front on on the way back to T2. The run, realising how much the hot humid conditions has dehydrated you on the bike, you then run along Al'ii Drive to the first turn, which can be hot, humid with no wind due to the sheltered conditions. Once you come back to town and negotiate Palani Hill, you have the long run along the Queen K, down to the Energy lab and return to the finish. How far do you go, heat/altitude chambers to acclimatise you? This stuff is peripheral and should only be canvassed once the main priority PLAN of how best to condition the body to be as fit and strong as possible to handle what Hawaii has been set. it has to be a different approach to any other qualifier Ironman. 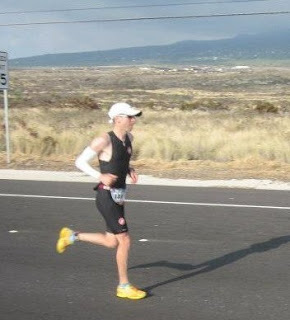 Unlike Melbourne, relatively more athletes in Hawaii ride strong, then are able to run a fast marathon off the bike. Yes you still get your T2 superstars that look great off the bike, and bomb on the run, but more athletes have the leg strength to put together a strong run after a punishing bike effort. Just looking at how my team went last year at Hawaii after all qualifying at Melbourne 2012. The key to their great performances at Hawaii, beating alot of the athletes that had their measure at Melbs was they ALL ran very well. ﻿﻿3 of our 6athletes went sub 3:30hours on the marathon run with Stephen Guy our fastest at 3:08hrs. 2athletes went between 3:30hrs and 4:00hrs with only one over at 4:07hrs, our girl Cym only in her second ironman. This saw 3 of our 6athletes go sub 10:00hrs for the finale, with Stephen Natoli a sharp 9:37:20hrs on a tough day. So now you have qualified, do you just do the same prep as you did for your qualifying event, i don't think so. If you ran ok, but not great in your qualifier, then this could be magnified on the big island due to the environment. You need to think laterally and have everything on the table when you go to the big show. Work out your periodised blocks and the emphasis of each. But planning the swim bike and run in isolation will be a mistake. As Hawaii qualifiers, your ability to swim well without losing too much time, riding strong and fast, and then still having some in the tank for a strong run will be key to success on a much bigger stage.